SIRAH Course, May 2015 - Application is open! Thanks to the generous support of FOCEM-IP Montevideo (COF 03/11) we will be able to provide full accommodation on a shared room basis, per diem and local transportation to all participants from abroad. Travel costs must be covered by attendees' funds. Local facilities will allow for each student to work with an individual computer, as well as access to a full step up to perform hands-on practical sessions. 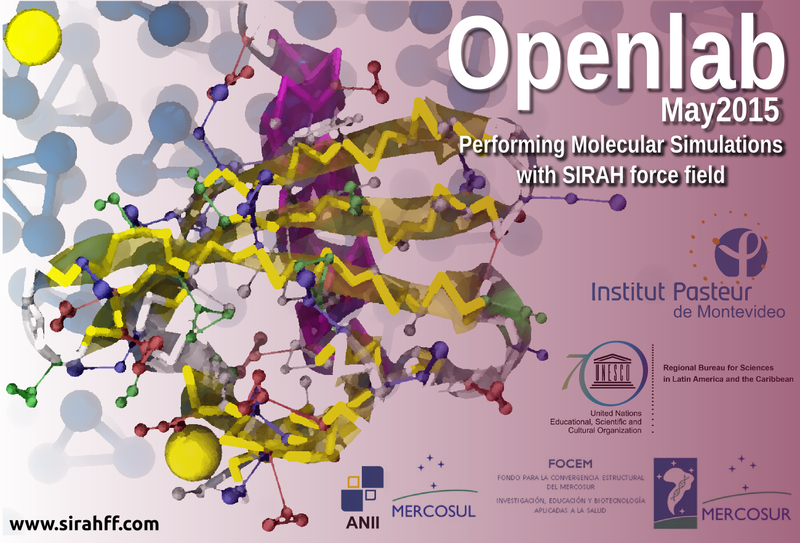 This OpenLab course is intended for PhD students and young research scientists with experience in molecular dynamics simulation and a specific problem to solve using a coarse-grained approach. 10 to 15 students will be selected, giving priority to those working in South America (no selection on the basis of nationality). The program will cover major aspects of understanding and using all features of SIRAH force field, which include DNA, protein and multiscale models in explicit and implicit solvent, to address the problems proposed by the attendees. Strong interaction between teachers and students will be promoted through participant's presentations, hands-on sessions and dedicated slots for discussions on participants' research problems. The language for the whole course will be English.